The first day of your holiday will begin with arrival at the modern Nugrah Rai Airport. Our efficient and courteous representative will be waiting for you to help facilitate your transfer to the hotel. On arriving at the hotel, you will enjoy fast and seamless check-in and be shown to your room. You can use the rest of the day to explore Bali city on your own. Alternatively, you can consult our representative to learn more about our Bali city tour packages that you can avail. You will be staying overnight at the hotel. After a wholesome and sumptuous breakfast, you will head to Ayung River to enjoy white water rafting. This river is popular among rafting aficionados. While the rapids are challenging, novices and beginners can also navigate them. This three-hour long adventure is exhilarating. Thereafter, you will enjoy a delicious lunch at an Ayung restaurant. Since white water rafting is a tiring activity, we will be returning to the hotel, where you can rest and rejuvenate yourself. You will enjoy an overnight stay at Bali, which includes breakfast and lunch. On the third day of your Bali adventure holiday, you have the option of enjoying cycling at Kintamani Volcano or taking a cycling ride along Jatiluwih rice paddy fields. This tour starts early and you will first enjoy a small breakfast where you can feast your eyes at Gunung Batur Volcano and the shimmering lake. Then you will be transported to the starting point of the tour that will take you through quaint local villages where you can halt and relish fresh coconut water and also visit a traditional village home. This cycling adventure allows you to navigate through Jatiluwih, which is a UNESCO World Heritage Site. You will be in bliss as you cycle through the lush and swaying terraced rice paddy fields. At lunchtime, you can admire the panoramic vistas as you devour a delicious meal. After the cycling, you will return to Bali to settle in for the night at your hotel, and this overnight stay includes breakfast and lunch. After enjoying another tasty breakfast at your hotel, you will be transported to the airport to catch your flight home or to another destination. A holiday on the Indonesian island of Bali is replete with nature, culture, spiritualism and art. You can have a memorable Bali adventure holiday that you will cherish forever. Most holidaymakers visit Bali for its stunning beaches, like Kuta Beach, Nusa Due Beach and Seminyak Beach. However, there is so much more to Bali. You can visit Ubud, which is home to endless terraced rice paddy fields. As you travel along the road of Tegallalang, you will come across stalls that offer gorgeous curious and trinks. Ubud is also the location of the Ubud Monkey Forest, which is home to grey, long-tailed macaques. You can take a trip to Kintamani, which is a popular destination in all Bali tour packages. Here, you will find the active Mount Batur volcano and the mesmerizing Caldera Lake. Be sure to take a trip to Lombok Island, where you will find several hidden treasures that most travel guides do not reveal. But do not forget the azure waters and golden sands of Bali, where you can truly relax and unwind, and throw caution to the wind! Isn’t that what adventures are made of? Going on an adventure holiday should never be synonymous with chaos and hassles. Instead, when you have a professional planning every aspect of your Bali adventure package, you know that it will be fun, thrilling and memorable. 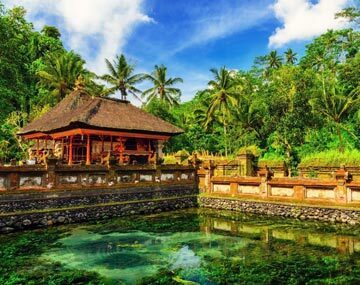 After all, four days should be sufficient to enjoy the warm, crystal clear waters of Bali, get awed by the regal and stunning temples and stay mesmerized by the natural beauty. That is why we have come up with the perfect Bali, Indonesia, tour package that takes your adventure holiday to the next level. And, you will be pleased to know that we offer attractive and cheap Bali tour packages that will not burn a hole in your pocket. Our package encompasses everything, right from bookings, reservations to logistics so that you can enjoy the thrill of holidaying in Bali like never before. In Bali I had a Blast ... Oh My God the Volcano Cycling Experience i got to know this by BookOtrip. What an Experience.... so Unforgettable.